Old Forge, New York, in the Adirondacks, one of the nation’s largest parks, is the snowmobile capital of the East and every season the town strives to prove it. To start with, there are hundreds of miles of snowmobile trail systems offering diverse riding. 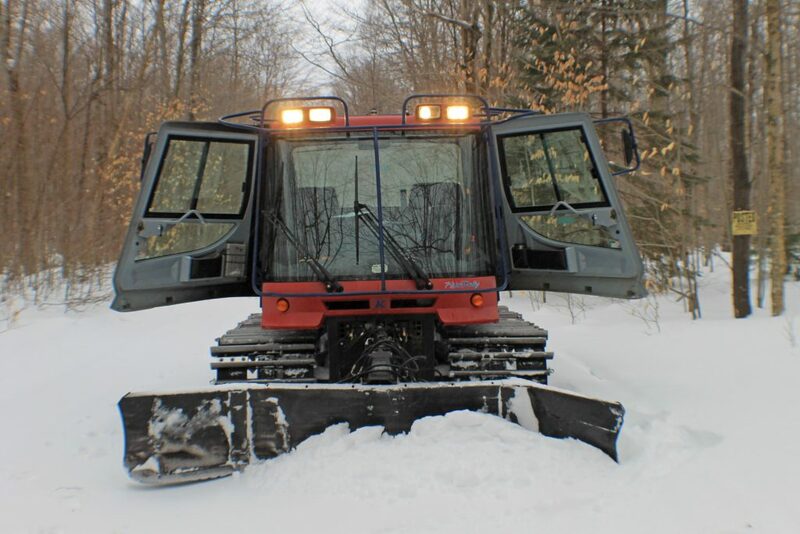 To keep the trails in tip-top shape there are two shifts of professional groomers and this is their story. The grooming effort of two shifts per day by a crew of up to fifteen full-time employees keep the three dozen trails that cover nearly 500 square miles in shape. Five PistenBully Snow Grooming Machines run mostly at night. All this effort establishes a base that stays throughout the winter weather cycles. The Old Forge trail system connects with the New York State snowmobile trails system, which allows riders the opportunity to extend their ride even further via the NYS trail system. The Old Forge Snowmobile permit fees are; Full Season Permit: $80, Full Season Weekday Permit: $50 (good Sunday eve—Fri eve), 7-day permit: $45 (upgradeable to a Full Season Permit anytime during the season for an additional $35) Season runs from December 3, 2018 – April 1, 2019. There is a special permit sale at SNOFEST March 8-9, 2019: buy next season’s (2019-20) permit at the $65 preseason rate, and ride the remainder of the 2018-19 season for free. The Economic Impact of snowmobile traffic should not be overlooked. Every snowmobiler average $231.00 per day investing in the local economy. Annually $25 -26 million dollars goes into the Old Forge economy based on this data. $65.00 Old Forge Snowmobile permit fee goes up November 15th to $80.00. In addition to great conditions, there are snowmobile events not to be missed; “Snodeo” is in early December and “SnoFest” is in early March. Ask at the Old Forge Visitor Information Center or visit OldForgeNY.com or ExperienceOldForge.com for details. Thanks to Mike Farmer, Tourism Director in Old Forge for information contained in this blog.